Today’s Meatless Monday is the Valentine’s edition. This year’s Valentine’s Day meal was completely meat-free! We enjoyed these peppers so much, we didn’t even miss the meat, however, I think these would be delicious stuffed with some of that fancy chicken sausage. These peppers took center stage at our Valentine’s dinner party. This was my first time (and not the last) eating quinoa. We had some friends over for a nice Valentine’s Day dinner party. We enjoyed a completely vegan and gluten free dinner. It was so much fun cooking for them, since I had to think outside of my “meat eating, gluten indulging” box. I served these peppers with a variety of roasted vegetables (purple potatoes, brussels sprouts and asparagus), and portobello mushroom caps. We ended our meal with a delicious heart-shaped gluten free Red Velvet cake. Place 2 c quinoa and 4 c stock in pan over high heat. Boil for 5 minutes, cover and remove from heat, let set for 15 minutes until soft and translucent. Stir in artichoke hearts, spinach, and tomatoes. Lightly salt the inside of the peppers. Arrange peppers in a 9x13 baking dish. 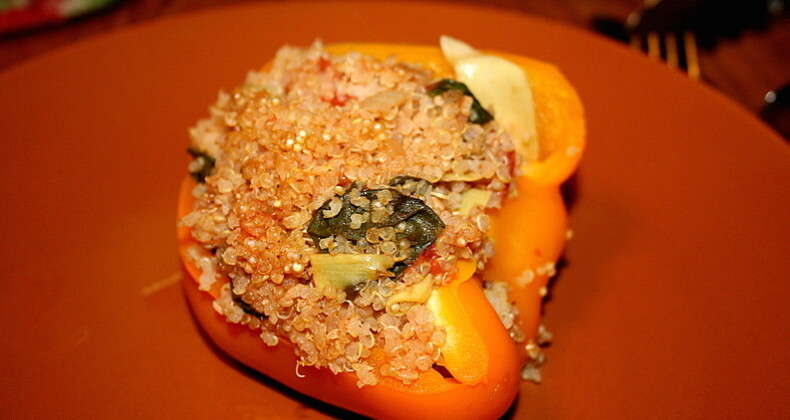 Fill peppers with quinoa filling. Pour 1-2 c stock over peppers, adding the rest to the bottom of the pan. Cover with foil, and cook for 50-60 minutes. 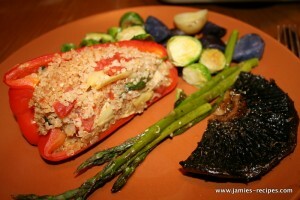 You will want your peppers to be tender when you remove them from the oven. ENJOY!